Thomas turned 6 months on Monday, so I thought an update was in order. He had his check up today and weighed in at 14 pounds and 9 ounces. He measured up at 27 inches. 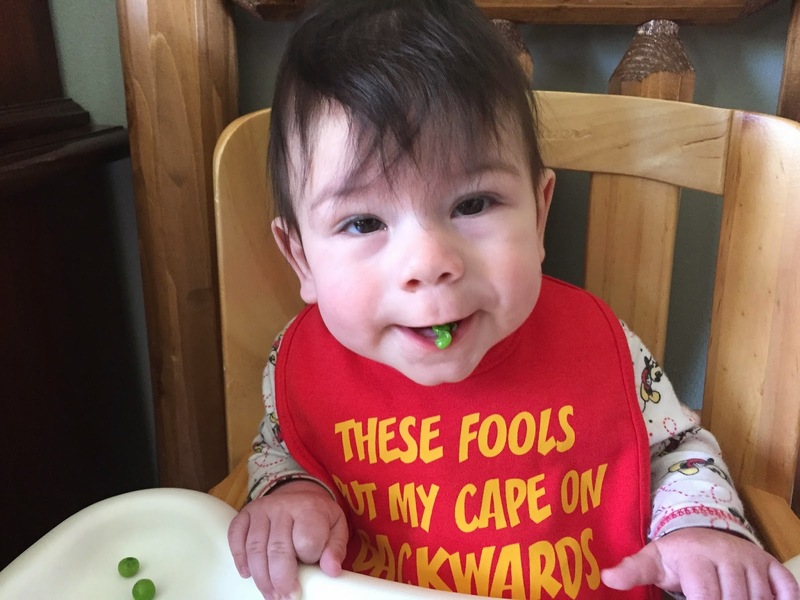 That puts him in the 80th percentile for length and the 5th percentile for weight. In the past 2 months he grew an inch and a half but only gained half a pound. My kids' weight gain always slow down when they start moving (and I'm sure "the plague" didn't help) and I've had two kids healthy as can be yet in the 4th and 1st percentiles at their 1 year check up. He is healthy and doing well, but we will be watching his weight over the next few months. It all began with planking. I posted this picture to Facebook and informed my friends I'd never had a baby do this before and didn't even know what to call it. A few friends told me they call it planking, so that is what I'm calling it. 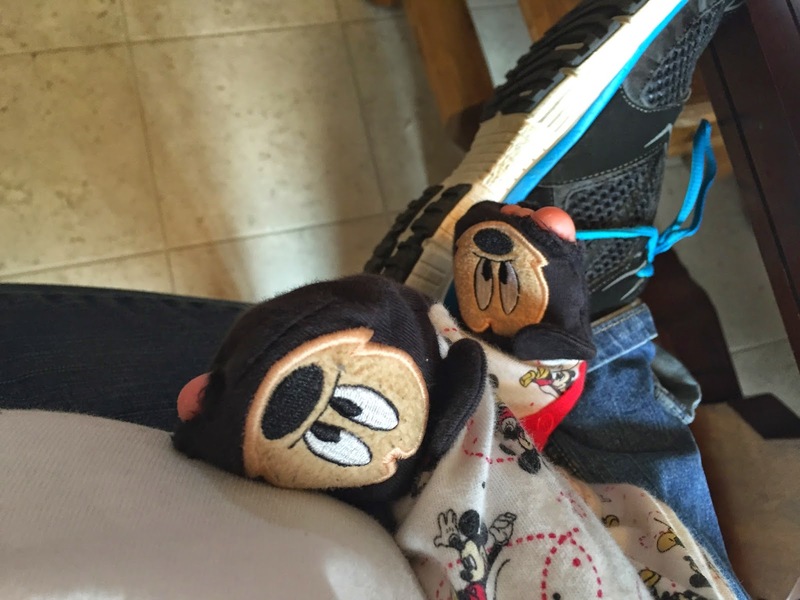 And he did this so much that that perfectly good brand new Mickey Mouse outfit that had never been worn before him and never before March, now has holes in the toes. He has definitely been working out and working hard. 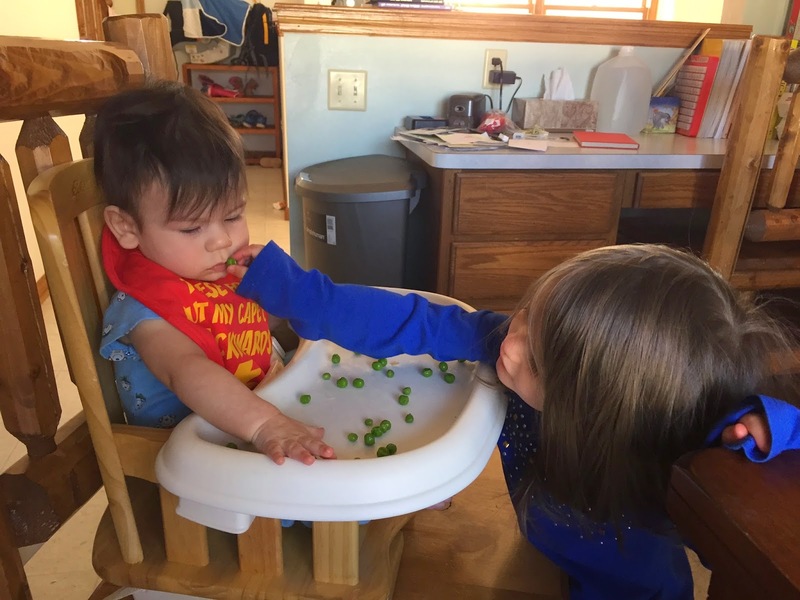 I have tried to introduce solids. And I tried a bit of bread. But he doesn't like anything solid going in his mouth. I've never had a child hit 6 months and not be eating some form of real food but he is perfectly content to nurse and sees no need to change things. 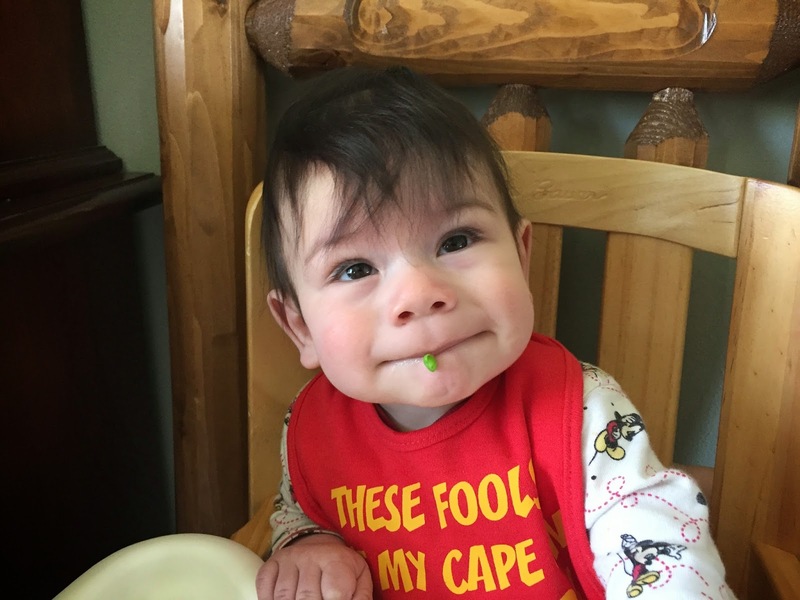 The pediatrician suggested letting him try to feed himself, that the difficulty might just be his independence and disgust that I would put something into his mouth for him. So I tried this evening. 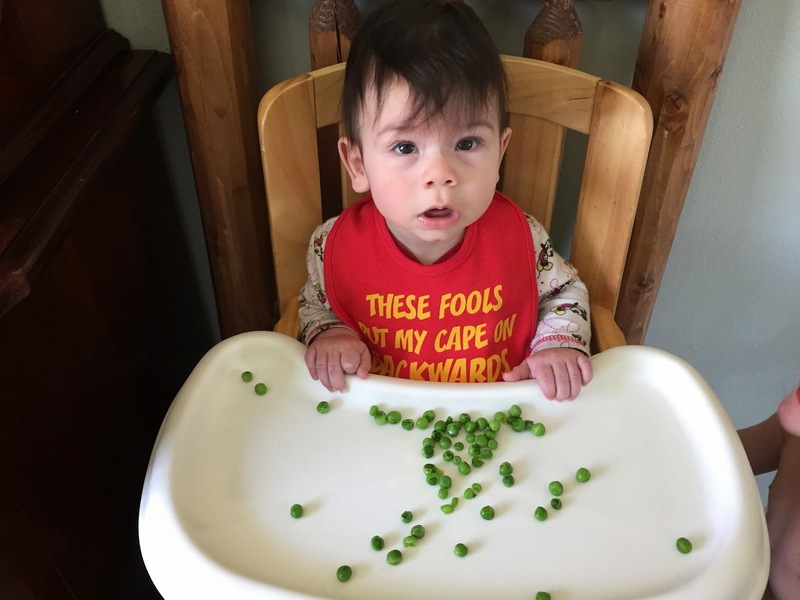 Impressively he sat for 20 minutes just looking around and smashing peas. 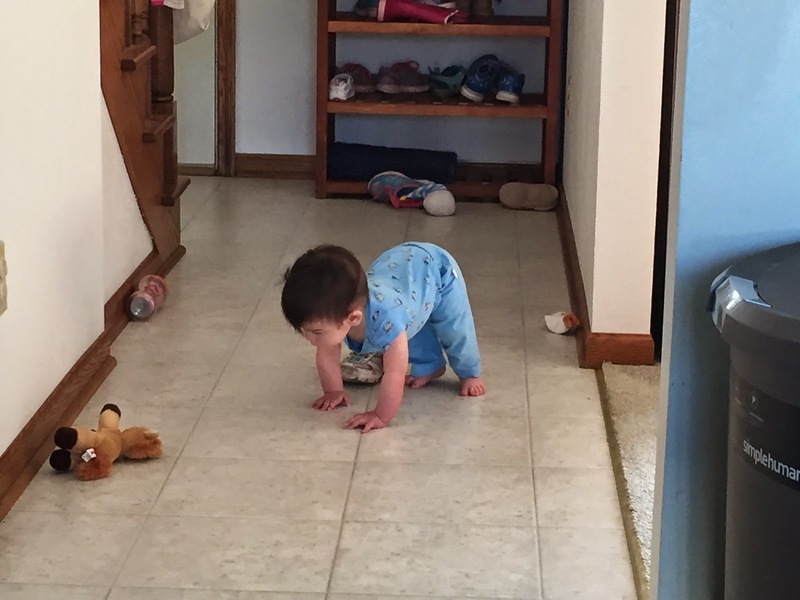 And he is apparently trying to find away around the slipping on the linoleum. He is a very social little guy. He loves people and faces and smiles a lot. So far I think his best buddies are Cecilia and Brigid. Cecilia is like another mom to him, carrying him around, keeping him happy, etc. And Brigid is just the right size as a playmate. 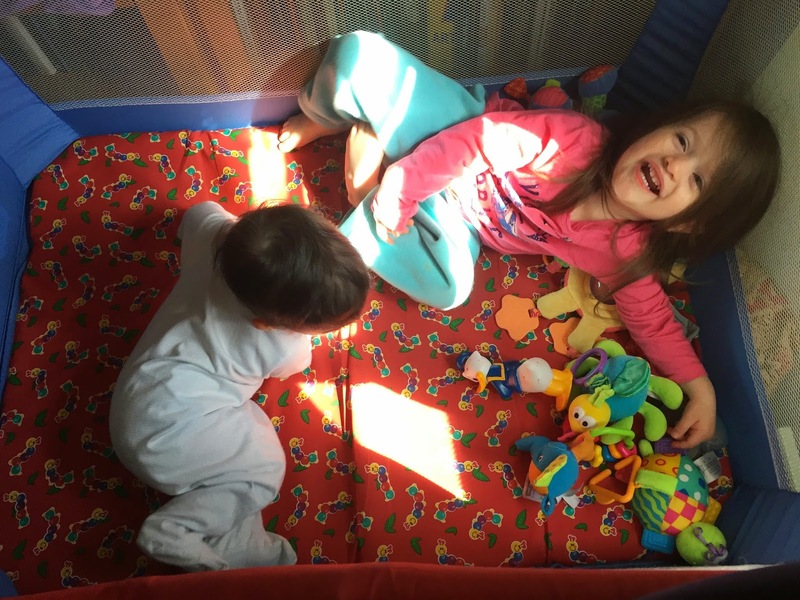 She even climbs into the pack 'n play and plays with him. They all shower him with hugs and kisses though. 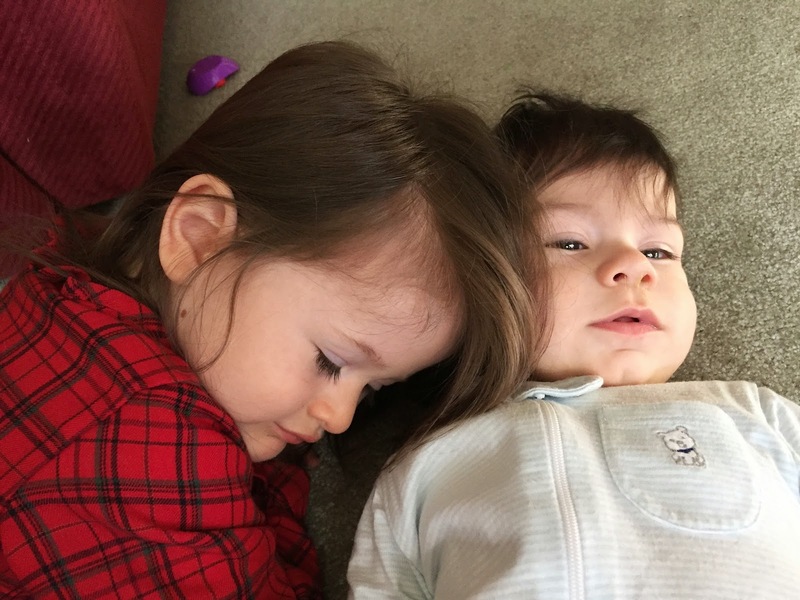 It will be interesting to see their relationship develop when he is bigger than she is, which I imagine won't take more than a year or two. He is very healthy, very active, very social, very sweet and very laid back (it amazes me what he lets his sisters get away with without crying) but he is a sensitive sleeper, so nights aren't great. He naps great going to sleep on his own in his crib and sleeping for hours, but at night he will only go a couple of hours in the swing before he wants me and he comes to bed to nurse, snuggle and drift in and out of sleep. It is far from perfect but between a cold last week and two visible bottom teeth trying to break through it isn't a good time to try to change it on him. It is also the only time of the day he has with just me and no siblings around to share me with so even the pediatrician thinks some separation anxiety is playing into it. We will see how much we can chubby him up before his 9 month appointment but honestly, he is the sweetest little guy and we are so very blessed to have him. I bet his weight shoots up before the next appointment. At our last one James had gone way down (from what it was before) to the 25th, but this time it shot back up to the 95th. I think sometimes they grow so fast that it takes their weight a while to catch up. 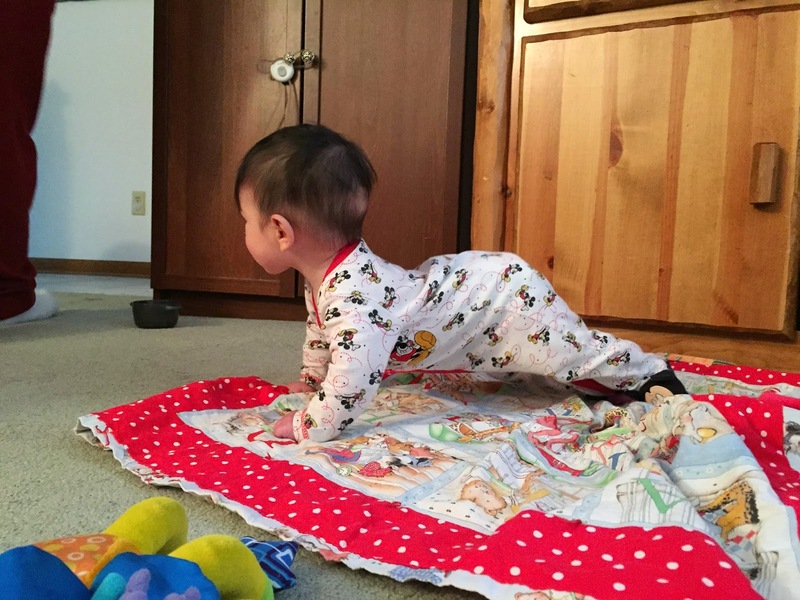 And I can't believe he's crawling! It's so much fun to watch him in the videos making his way around! He is ADORABLE!! 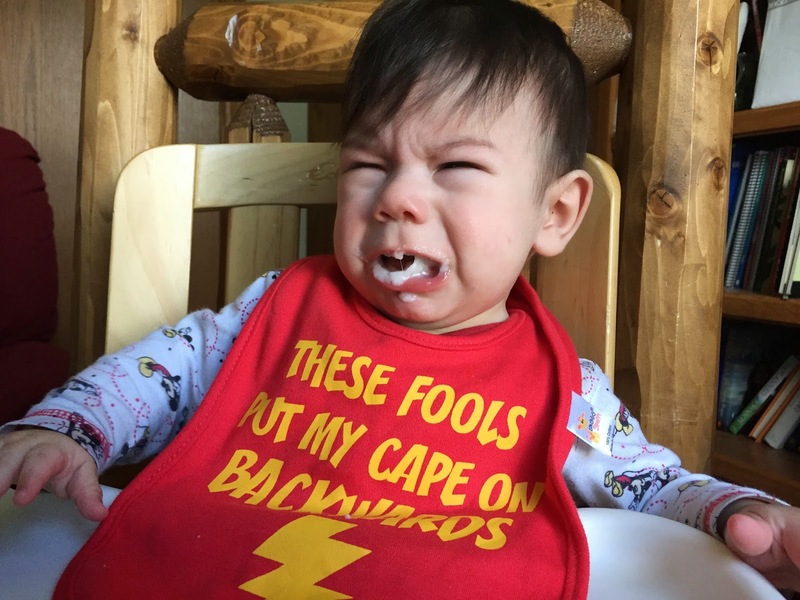 I love his bib - how precious.